COOL: Le Gavroche (but was Michel-in?) | Everything is cool. We’re greeted at the door of 43, Upper Brook Street and led past the landed gentry of Mayfair to the dining room downstairs. Then we’re shown to our table, offered a glass of Champagne and left for a moment to take in the surroundings of Le Gavroche, the first restaurant in London to be awarded one, two and then three Michelin stars. It retains an enviable two. Opened in 1967 by brothers Michel and Albert Roux, and now run by Michel Roux Jr of Masterchef fame (akin to Hollywood in the culinary world), it has an impressive alumni who have risen to similar gastronomic eminence – Marco Pierre White, Gordon Ramsay and Marcus Waering to name but a few. The menu is entirely in French (after all, this is a bastion of French dining) and a waiter comes to guide us through the set lunch menu, which although not cheap, is still good value at £52 a head for three courses, half a bottle of wine each, petit fours and coffee. To start – Jerusalem artichoke velouté with sliced radish and cured ham, which arrives delicately presented in a shallow bowl before a waiter pours the velouté expertly around the island garnish. Accompanying this is a true slice of Burgundian cooking, Oeufs en Meurette: egg poached in red wine on a toasted brioche with a red wine sauce. All around us, a theatrical company of well rehearsed performers plate food and take orders; the head waiter a director of sorts adding final deft touches where necessary. Before the main arrives, the manager passes by to see that we’re being looked after. He is charming and cordial and effortlessly soaks up the time taken for the chefs to prepare our main. 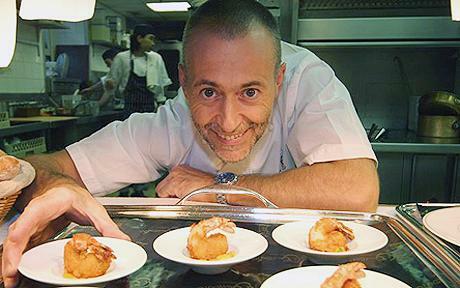 We ask if Michel Roux still cooks here – many of his peers have turned their hand to ‘chef consultancy’ or are too busy looking after their holdings to cook. ‘Of course, he’s in the kitchen right now,’ he replies. He feels a tap on the back and passes a waiter our empty plates, maintaining the conversation throughout, before serving us with our next course, at which point he wishes us bon appetite and leaves. Another waiter arrives to pour a chive butter sauce around my dish as a final touch to what I’m about to enjoy: Pan roasted pollack on wilted swiss chard with purple majesty potatoes. The fish tastes fresh off the boat – the flesh is sweet and the skin is crisp. The chive butter sauce is beautifully seasoned. On the opposite plate is the game pie, encased in immaculate puff pastry, surrounded by a Madeira sauce. The meat is succulent and the sauce delicate and fresh. The wine’s pretty decent too: A Macon-Uzichy from Burgundy is decanted into a small crystal carafe which sits elegantly next to its counterpart, a rich red from the Languedoc. A soft, fluffy pillow arrives with an enveloping crème anglaise to be poured over and around it. My stomach says yes, but my arteries say no. Underneath lie sticky marbles of fruit and the smell of caramel fills the air. Dessert is an omelette soufflé with prunes cooked in Armagnac. It’s luxurious and indulgent. Coffee follows to wipe the palate clean, along with the petit fours. Two and a half hours have flown by, and as we are left to admire the front-of-house once more, Michel Roux runs a discreet victory lap of the restaurant, arriving at our table to shake hands and check everything was to our liking. Above and beyond. I can’t believe Michel Roux came round and shook your hand..that is pretty above and beyond!